If last week’s journey to Birmingham for the Vulcan Invite represented a step up in competition, this weekend will be a leap. The Govs will square off against the upper echelon of the SEC, with student-athletes from Alabama, Auburn, Kentucky, Mississippi State, Ole Miss and the host Commodores set to compete, with upper-tier programs such as Georgia Tech, Cincinnati, Middle Tennessee, Connecticut and Furman—all top-100 programs in the most recent U.S. Track & Field and Cross Country Coaches Association (USTFCCCA) Nation Rating Index—also set to compete. Ohio Valley Conference brethren Belmont, Tennessee State and Tennessee Tech also are slated to be part of a field jam-packed with talent. This meet will be about measuring up to some of the best in the land, and the pole vaulters for Austin Peay are well-prepared for that challenge. Seniors Savannah Amato and Dascha Hix—both ranked among the top-75 in the event entering the weekend—will be joined by 2018 OVC Outdoor Freshman of the Year Morgan Bradley in the invitational portion of the pole vault, which features three other top-100 performers, in addition to two-time NCAA Regional qualifier Caleigh Lofstead of Vanderbilt. Sophomore Sabrina Richman has already proven herself more than capable of hanging with All-Americans; she’ll get another chance to do so this weekend in a loaded 400m field. She’s the top-seeded runner in the second heat, with four top-100 runners also slated to compete over 11 heats, including Middle Tennessee’s Jocelyn Assafuah, ranked sixth heading into the weekend and Richman’s biggest competition. 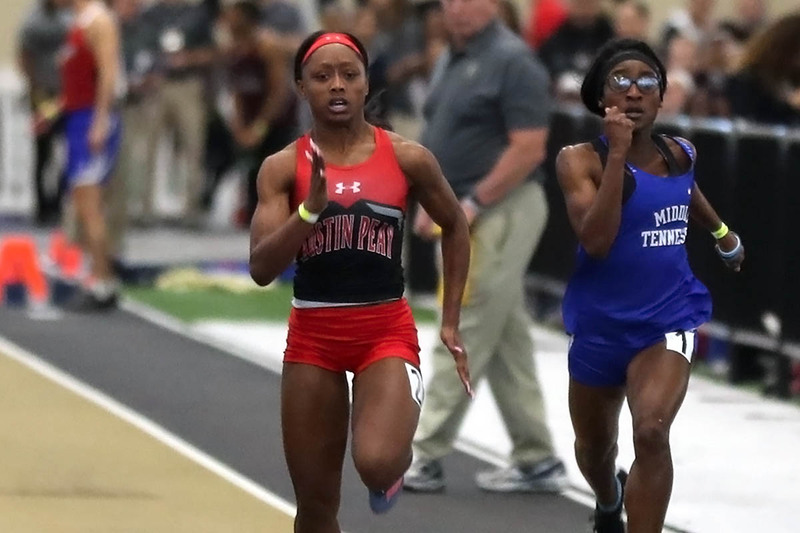 Junior Tymeitha Tolbert is one of seven top-100 runners in the field for the 60m dash this weekend; she’ll take off in Lane One as the top seed in Heat Five of the eight-head field. Keep an eye on junior Maya Perry-Grimes—she doesn’t have the history or pedigree of Tolbert in the 60m, but she’s in Heat Two alongside Mississippi State’s Faith Gilbert (ranked 75th) and Middle Tennessee’s Cecilia Francis (81st). Live results will be provided by CFPI Timing at the above link. A complete recap from both days will be provided at LetsGoPeay.com at the conclusion of events.